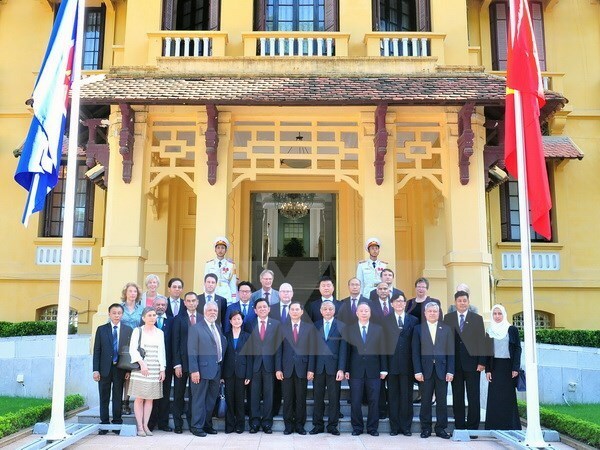 Hanoi (VNA) – The Ministry of Foreign Affairs held a flag raising ceremony in Hanoi on August 8 on the occasion of the 50th founding anniversary of the Association of Southeast Asian Nations (ASEAN) and 22 years of Vietnam’s membership in the association. The event was attended by Deputy Foreign Minister Bui Thanh Son, Deputy Minister of Labour, War Invalids and Social Affairs Doan Mau Diep, and Vice Chairman of Hanoi People’s Committee Nguyen Van Suu, among others. Foreign guests at the ceremony included head of the diplomatic corps in Hanoi and Ambassador of Venezuela Jorge Rondon Uzcategui, and Ambassadors and embassy representatives of ASEAN member countries and ASEAN partner countries in the capital city. Addressing the ceremony, Deputy FM Bui Thanh Son emphasised that the founding of the ASEAN Community in 2015 is a historic milestone in the connectivity process of ASEAN. It also bears special significance to the association, the region and each member nation. The deputy minister noted that with a population of 630 million, GDP of almost 3,000 billion USD and a growth rate of 4.7 percent in 2016, ASEAN is the driving force of the regional economy. He went on to say that as a prestigious organisation in Asia-Pacific, ASEAN operates based on the ASEAN Charter and uniform values and principles. The ASEAN way is built on the foundation of the Eastern culture, attaching importance to solidarity and common prosperity, tolerance and harmonious interests, which helped ASEAN achieve success over the past five decades. Deputy Minister Son highlighted that ASEAN cooperation is one of the top priorities in Vietnam’s foreign diplomacy, and the country is proud about its active, proactive participation and considerable contributions to the cooperation process and building of the ASEAN Community. During the process, Vietnam has been involved in the drafting of major orientations for the bloc’s development. The country has also put forth many initiatives on maintaining a security and stable environment for cooperation in the region. The deputy minister expressed his belief in an ASEAN bloc building on past achievements and growing strongly in the future. He said in a changeable world situation, ASEAN’s achievements of cooperation in general and of economic-trade development in particular prove that the bloc has made the right choice in its guidelines and policies.